Why Use the NEO4J Graph Database? About 10 years ago, I went to a BIO-IT conference, and looked a spiralling 3D model of a very large molecule made up of hundreds of atoms. I thought, “that does not look like the rows and columns in a relational database”. If I were to model that collection of atoms in SQL, how would I model the schema to store all the atoms? While it could be done in RDBMS and SQL, it would also require a fair amount of thought, code, and recursion to do it. But after a retrieval, what would the structure be after it was retrieved, rows and columns? With all the reads, how fast would the retrieval time be for each molecule? Lately I’ve been looking at the Graph Database, NEO4J. It looks like it can easily do many things better than a traditional RDBMS could. The graph database looks better suited to some applications than RDBMS, or linked lists. For example: molecules, tree structures, social networks, or paths. Compared to a RDBMS, one interesting aspect about graph databases is how relationships contrast between them. In a RDBMS, the relationships are predefined by CREATE TABLE, PK/FK, and inserting rows in the database. The structure of the relationships will never change until the architect or DBA changes the schema and moves the data. It’s for this reason, I think that schemas and table structures should be given a lot of thought, refined, and changed over time. In a graph database, the relationships are constantly changing and dynamic. Modelling a social network in a graph database, as multiple people connect, the new connections between the nodes, become the new relationships. It’s a new paradigm. Here, I’ll show some initial explorations with NEO4J. Download NEO4J and install it. Download the movie database and overwrite the old database. There are even some canned queries are there for you. The NEO4J software just unzips into a directory. No RPMs. No running an executable. One thing I have to give NEO4J a lot of credit for, is how easy it is to install. If you have looked at some of my other posts, such as VM Ware Player vs Virtual Box, you know that I am demanding that software install intuitively and easily these days, and not require reading a 150 page installation document as a prereq. One point to note is that Java 1.6 is required to use NEO4J. If your $PATH defaults to an older version of java, or, you don’t have Java 1.6 installed, NEO4J won’t work. Interestingly enough, when I substituted the server name, and the server’s local IP address in the URL, I got the error: “Could not connect to remote server.” But administration later. When I started working with Oracle, before I could create any queries, I first needed to know information about the tables and schema that I was working with. If I didn’t know the table name, I couldn’t query it. Two key things helped me. One was the Oracle data dictionary. So, if I wanted to know what tables I had access to, I ran the command: Select table_name from All_tables. Then, in SQLPLUS, I used the Describe command, which would tell me a table’s structure. I could cut and paste all the fields into a query. This is what I call, navigating. Here are some useful queries to navigate the NEO4J movie database. Query not executed yet. Press the search button or hit CTRL+ENTER inside the query editor to execute it. Remove any blanks, and place Start in the upper left corner. 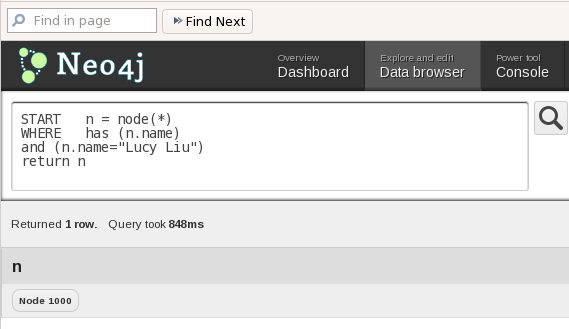 Another place to find the node count is in Overview:dashboard. There, you can also see the the number of relationships, properties, and relationship types. In an RDBMS table, Person, every row will have every column in its structure, including name. If Person.name is allowed to be NULL, some rows may have NULL in that field. The error occurs because there are different kinds of nodes, with different properties in the nodes. One way to make the above query work is to filter only those nodes that have the property, name, with the function, HAS (). This is a very useful query. To write queries to filter for the different kinds of relationships, you first need to know what the relationships are, and their exact spelling. One point to note is that in Cypher, the phrase, “GROUP BY” is actually not used in the query. GROUP BY is implied with the aggregate function, count(*). ORDER BY is used in the same way as in SQL. Although, unlike Oracle, you cannot order by listing the column position. This query executes, but is not ordered by either type(r), or by count(*). NEO4J can return just individual properties (columns in SQL) or entire objects. The previous query for “Lucy Liu” returns just the text of name. The following query returns the entire object. In this case, the node is identified internally as Node 1000. One thing that seems odd, is that for Node 1000, the value for the property, ID, is actually “140”. N.id (“140”) is not the same as the internal identifier of Node (1000). This is different from using sequences as unique identifiers with RDBMS. I sense that it is a java thing that runs under the covers. I’ve been trying to get a query to return these Node IDs, but so far I haven’t figured this out. If anyone knows a query that will work, please let me know. Giving credit, some of these queries came straight from these links. This entry was posted on Sunday, February 3rd, 2013 at 12:02 am and is filed under Graph Database. You can follow any responses to this entry through the RSS 2.0 feed. You can leave a response, or trackback from your own site. Thanks a lot for your feedback, good article. Regarding ordering by column number, I don’t think that is very maintainable. But you can give your columns aliases with AS and order by them.